The best of Greek design is coming to Dalston in early July as Meltemi opens its pop-up shop at Maybe A Vole in King Henry's Walk, N1. See below for details of the brands represented, and make sure you visit for the week that it's open. 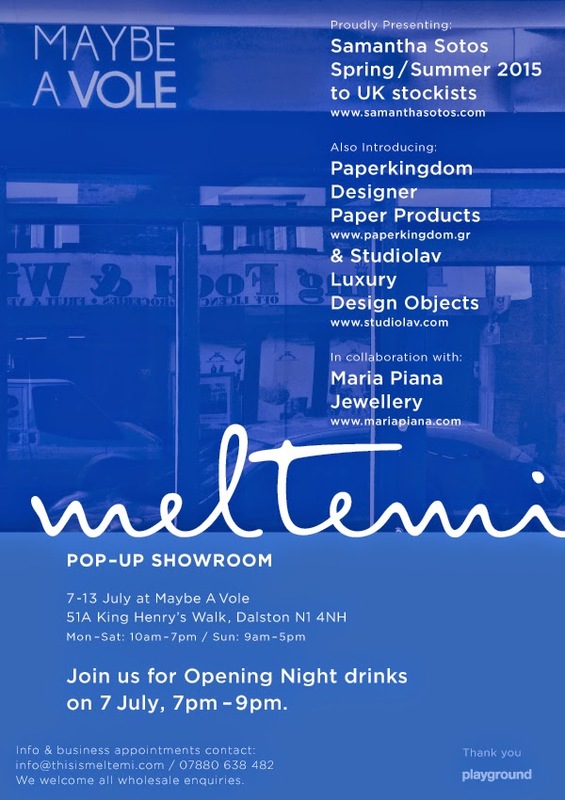 "Between 7 and 13 July the Meltemi showroom will be presenting the best of Greek luxury design to the London market at Maybe A Vole. Fashion, jewellery, designer stationery and objects will be available to view for the retail and wholesale market. Samantha Sotos womenswear – the Spring-Summer 2015 collection – Samantha blends her Australian and Greek backgrounds to create her unique ‘Euralian’ look and what British Vogue recently described as 'relaxed elegance with an expressive European polish'. Samantha has received acclaim in Greece since the label’s emergence in 2006 and is now responding to calls to expand into Europe. Alongside the womenswear, the similarly inspired and liberating childrenswear will also be exhibited. Studiolav - luxury object design studio – Loukas and Vasso are a duo that draw on their talents to look into different ways of reinterpreting ideas and typologies. With playful and ironic spirit they express their investigating tendencies and curiosities regarding perceptions of form and materiality. They highly value the importance of the emotional connection between people and objects and they often use narratives to expose it. Come see their highly acclaimed and archaeologically inspired tableware, ‘Design is Dead’ pencils, olivewood pyramids inspiring designer baking and their ‘Atlas Shopper’ that has been a surprise hit in Europe this Spring. Paperkingdom – Paperkingdom pokes fun at the Greek state fascination with paper bureaucracy, by collaborating with the best of Greek graphic designers to create wonderfully playful luxury stationery and paper objects. From notebooks that let you discover the inside track on nuclear missile development to diaries beautifully and colourfully stitched to allow for practical use. And because we all love a bit of Greek mythology, the Meet the Greeks paper toy series, which has delighted kids and adults alike, will also be on sale. This event is being hosted in collaboration with Maria Piana Jewellery whose celebrity-loved collections will also be on show. The likes of Will.i.am, Beyonce and Nicole Scherzinger have adorned themselves with this designer’s creations and are finally available to order.Maria Piana has become synonymous with original design and the use of industrial processes combined with artisan experimental techniques, delivering unusual and new forms of abstract jewellery adornment.All pieces are handformed and produced in Greece, a country known for its supreme jewellery quality."